This article has been written as part of the ‘Life Beyond Norms‘ series; a collaborative project aimed at dispelling societal norms that have been handed down, or unwittingly thrust upon us. This is an attempt to provide thoughts against these norms to encourage us to think deeply and consciously of the values we hold; to ensure they do actually add value to our lives and society as a whole. Other contributors to the series include The Everyday Minimalist, Alyson Earl, Puttylike, and Axis of Awesome, A World of Inspiration, Locationless, Small Things First among others. I’ve lost count of the number of times I have heard people lament that they wish they could travel more but they have kids so it’s not really an option. Actually I’ve been guilty of that kind of stifled thinking. The truth is when you have kids traveling is not an impossibility. In fact it’s probably the greatest thing you can do for your kids and for yourself. In this post we’ll explore a few of the arguments against traveling with kids and show you that they are in most cases false. Sure, it can be more expensive but it’s not as expensive as you might think. There are plenty of good deals out there for kids depending on where you want to travel and what you want to do. You can look for family packages, save up frequent flyer miles to help pay for flights, look for kid discounts. There are always options available to you. If your kids are anything like mine they eat like birds so food costs will not be as much as you might expect. I look at it this way, the benefits my kids get from traveling the world far outweigh the cost. As parents we are always concerned about the health and safety of our kids. How many times have you worried that travel to some exotic location may expose them to a disease or serious illness? I’ve often thought like this until I realized that my kids could get sick anywhere. Sure they may have a greater chance of getting sick in another country but they might not either. Lessen that chance by getting your kids immunized. There is no denying that travel with kids can be a lot of work and will at times try your patience. But then most things that are worth anything in life take work. In my opinion the benefits far outweigh the few times your kids will cause an International incident. As parents we are obviously concerned with how long term travel affects our kid’s education. These concerns can easily be calmed by considering options such as homeschooling, International schools and by understanding that the experience of any travel adventure is a great chapter in your kid’s education and personal growth. Now let’s take a look at some reasons why you should travel with your kids. Which do you think is a better learning environment: reading about Borobudur in a textbook or actually traveling there and experiencing it in person? Learning from textbooks is fine but without supplementing it with actual real world experiences it loses it’s value. Ever feel like you don’t know your kids? Traveling is a great way to share an experience and further bond with your children. Think of all the incredible stories you can share with them. You’ll be creating memories that will last a lifetime! Our world has grown smaller with the ease of world travel these days. Children with International travel experience will have a unique world view that many kids their age will not have. They will experience other cultures firsthand and be exposed to new languages. It’s an opportunity that will serve them well in whatever career they decide to pursue. Dealing with issues while on the road and learning to problem solve are all things that will carry your child through life. Experiencing new cultures and places and learning compassion and understanding are key to developing world citizens. They will get to experience the diversity that our world has to offer. These are skills that cannot be taught in a classroom. Don’t look at having kids as an end to the adventure. View them as part of the adventure and journey. Remember, life isn’t really lived until you actually experience it. Still not convinced that traveling with kids is a possibility? Check out real people who are doing exactly that. Christine Gilbert (almostfearless.com) – Christine and her husband have been traveling since March 2010 with their infant daughter. Check out her recent post on flying with kids. Colin & Tracy Burns (ourtravellifestyle.com) – Colin & Tracy have been traveling the world with their two kids Noah and Hayley. They have been to Cambodia, Indonesia, Laos, Malaysia, Thailand and Vietnam. Here is what they are all about. Jeff and Kristy (vagabondkids.com) Jeff and Kristy travel with their two kids (The Vagabond Kids). They have been expats living in Asia for almost 13 years now. Theodora Sutcliffe (travelswithanineyearold.com) Theodora and her son are doing a Round The World (RTW) trek and really enjoying life. Make sure and check out all their adventures. Check out her report on schooling while traveling. The Bergrens (theworldiscalling.com) are a family from Colorado who have traveled with their 3 kids to places like Italy, England, France and throughout the US. It can be done! Don’t let stifled thinking hold you back. With proper planning and a little luck you can be enjoying all the world has to offer with your kids. Well our daughter is now 7 months old, has been or her first flight, and we are now just waiting for her to get the last of her shots at 18months so that we can explore some of Asia. People are always going to make excuses, but if you wait until you have everything ready – then you will never go. Because there will always be something that will stop you. Thanks for the great resource of bloggers who are traveling with children, I’ve been following Christine’s for a while but the others are all new to me. Hey Thomas! We were told the same thing. Get your travels in now because once you have kids it’s all over. Sure traveling with kids is going to be different but it’s still a blast. Best of luck on your travels! What part of Asia are you planning to explore? We would like to do Thailand and Vietnam for a couple of months each and then come home (Australia) for a while then spend some time in Europe. How is all your planning coming along for your sabbatical? Thailand and Vietnam are two places we would like to see as well. Our planning is going well. We are not along as far as I had hoped at this time but much of that has to do with a back injury I had a few months ago. Slow recovery time. Right now we are working on determining how much our monthly expenses will be in Indonesia. Wow! Thank you for featuring us here. It’s great that you’re doing the S-E Asia thing too! Hi Theodora! We are really excited about our journey, especially my wife as it will be a homecoming of sorts for her. It’s been fun following your own journey. Hi Zablon! One of the things I am really looking forward to is showing my kids new things and watching them learn and grow. I can’t think of too many better ways than getting out, traveling and seeing the world first hand. I think what we would be lamenting when/if we have kids is not that we can’t travel anymore (because as you point out, we can), but the fact that we’d have to get used to a different style of traveling. No more sleeping in airports and sharing dorms, or late night debauchery with your new-found friends… it won’t be better or worse, just different. Or I guess I can be wrong… what do you think? Hi Jill! You make a really good point that travel will change when you have kids. But then when you have kids your life changes anyway. We will be fortunate enough that we’ll be spending time with the grandparents so my wife and I will be able to get out and do some short trips for a week or two and know that the kids are fine. I think it is definitely more challenging, it can in many respects limit where you go and what you do (at least for younger kids). It will definitely be different. We’ve had 8 years now to adjust to the challenges of kids but I am sure we will still be surprised on this sabbatical. I think it is great that you are doing your RTW trip now because your life will definitely change when/if you have kids but as so many families have proven already it doesn’t mean you can’t travel and have an enjoyable experience. Great post, and so true. I remember being in Thailand and seeing a couple on the train I was on wheel their kids out in a double stroller. I was impressed by their willingness to do it and by the size of their modest travel packs. Personally, I have a number of friends with kids that fall into both camps – some have continued to travel, others not. I think part of it has to do with whether they were into travel to begin with. One way I’ve seen some of them manage the cost issue you mention is to really take advantage of local travel – camping, weekend road trips, intentional learning excursions, visiting an ethnic grocery store or restaurant, basically becoming a tourist in their own back yard. It may not be world travel, but I think, if done in the right spirit, parents can still expose their children to unique, mind-expanding things/people and foster a sense of curiosity and openness in them. Loved this article and wish more parents would have an open mind. As a child I lived in Mexico for 4 months – where I started kindergarten – and then a few years later when I was 7 we basically travelled through Europe for 3 months. Many of my friends (who are parents) asked me: well didn’t taking 3 1/2 months off during the school year (Feb.-June) affect your grades/school work? I tell them I learned more in those 3 1/2 years than I could have ever learned – the world is the best education possible (and I was essentially doing homework on workbooks from school). When I have kids I totally intend to take them with me on my trips. Thanks Shannon! I didn’t travel Internationally until I was in my 30’s. This may be why I am so excited to expose my kids to different cultures around the world. My first trip overseas was such a life changing experience that I know my kids will flourish and grow. It’s awesome that you had such a great experience in Mexico and then Europe as a child. 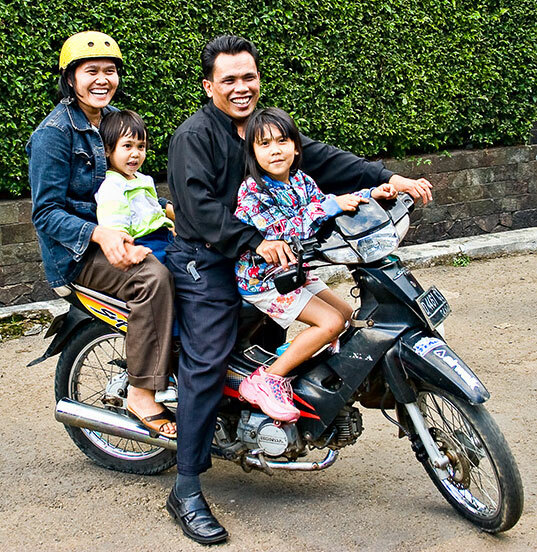 We plan to homeschool our kids for the year away and take them on small trips around Indonesia and hopefully SE Asia. Awesome Matt! These always inspire me to not rush everything now before I have kids. It’s refreshing to know that I can still travel in the future when I do have a family. Hey Matt! I guess if I were to offer any advice I would say do the trips now that you know would be difficult to do with kids. Everyone needs to make their own call on when is the best time to have kids but definitely don’t let kids hold you back from experiencing all the world has to offer. I know you have some great plans in the works so I’m excited to see what unfolds. Awesome post! We plan to start trying for a child next year and still want to travel quite a bit. You’ve given some great advice and resources here. I’m sure travel with children will be different, but in a really good way! Hi Andrea! It was quite an adventure when we took our 3 year old son to Indonesia. We had the luxury of flying Business class so were quite comfortable and all the staff of the plane gave us all kinds of attention because of our son. We used that entirely to our advantage too. We got to board the plane before everyone else and the staff spent a lot of time making sure we had everything. That is the kind of “different” that I like. Of course there was the one incident when a staff member bent down to pinch the cheeks of his face and he clocked her with a right hook. And sure, there are places I wouldn’t go with my kids and things I wouldn’t do but once you see kids light up when they experience things for the first time away from the comforts and familiarity of home it’s such an incredible experience. Thanks so much for featuring us as well. The Vagabond Kids can’t wait to meet new traveling families and I hope we can hike around Borobudur or other locales with you soon! Kristy recently posted..Travel in Asia- Yes- Bring the Kids! Hi Kristy! You’ve given us such inspiration and encouragement as have all the families we’ve discovered online that are traveling and enjoying life with kids. We definitely would love it if our paths were to cross at some point. Cheers! Great article. Although I don’t have children, I would most definitely take them traveling if I did. Some of my earliest memories are snakes around my neck in Tunisia and how green Austria is in the summer. I was 15 when I first went around the world (with my parents) and now travel is my passion. I learnt more traveling than any classroom could have taught me! Hey Si! You really said something that I think is really important for those that are worried about their kids education. You said you learned more traveling than in any classroom. I would totally agree. In my experience I learn more doing than in reading or studying. To see and touch and learn something firsthand…well there just isn’t a substitute for that. It sounds like you have had some incredible experiences in your travels. Hi Heather! Yes, traveling with kids is different than solo travel or with another adult but it’s definitely not impossible. I’ve been really encouraged by the number of people I have met that are out there enjoying the world as a family…kids and all. I can’t wait to get out there and prove everyone who told me we couldn’t or shouldn’t do it wrong. Touring with your family is one great experience sharing the moment together and learning the life outside the comfort of the home. Been planning to go on vacation by mid this year but not that far from home though. But great places to conquer. Wish your life journey joyous and memorable as you travel the world. Hi Adnes! Thanks for the kind words. Even nearby adventures with the family are great ones. We often travel to Portland (about 2 hours away) and explore the city, visit museums and have fun at the zoo. The kids love it and the best part is they usually fall asleep in the car on the way back home. At 32, the reason I decided to take a one year trip was exactly this thinking – it was my last grasp at freedom before I had to settle down and say bye bye to travel. But since having been exposed to so many families traveling I have to say its been really inspiring that it doesn’t have to end. Hi Ayngelina! Yup. it doesn’t have to end but it will be different. I think it’s good that you are out there now and enjoying your life and having all those adventures and creating all those memories because kids do change you (for the better of course) and travel won’t necessarily be the same. I think that is a good point to clarify that while you can travel with kids it’s going to have it’s own set of unique challenges. The one thing I have been surprised about in researching our Worldschool Adventure is the number of families who are traveling with their children. We are all an inspiration to each other and I just hope that we can inspire more families to take the plunge. Good on you Matt! Hi Amy! We are so excited about it and hope to meet other families on the journey. We definitely have some questions and concerns about home schooling our kids so it’s fantastic to know that there are other families out there being very successful at it. I’m very intrigued by ‘unschooling’. It sounds like a great option for our kids. I always thought babies meant the end of traveling and the career. I delayed and delayed and delayed and suddenly … the career wasn’t as important to me and I chucked it in to travel. I think I’m technically a traveling expat now. In November 2009 I returned to Australia to have a baby (because the maternity suite I saw in Ho Chi Minh City looked like a dentist’s surgery). When our beautiful baby was 11 weeks old we took her back to Ho Chi Minh City, where we planned to settle for a while. But the project I was working on was canceled, so we ended up in Singapore. We’ve had two trips back to Vietnam and one long weekend in Indonesia. The baby is 15 months old now and I think our next trip is going to ROCK. We’ve kinda worked out how to look after her and she’s old enough to eat what we eat and amuse herself for a few moments at a time. I’m really looking forward to our next trips, even if the past three were stressful at times. Thomas, Matt – if you need some Vietnam travel tips, I’m your girl. I’m working on a Ho Chi Minh City street food guide at the moment…. and it’s making me hungry. Thanks for this! I’ve always wanted to check out Vietnam. Maybe we’ll get the chance when we relocate to Indonesia. I imagine there are some cheap flights from Indonesia. So where will your next trip be taking you? We have some big plans this year. Australia for a wedding in the South Australian wine-growing region. Easter on the stunning Sunshine Coast. Malaysia or Bali in July (because we’ve organised a home exchange with a family in Provence). And then, if all goes according to plan, we’ll head off on a very slow round-the-world trip next May. We’ll probably return to Vietnam to live after the trip, though. I’m following your story with interest. Just haven’t commented before, been too busy setting up my own site, which has been quite frustrating at times. This sounds like a great adventure. Maybe we will see you in Bali. Best of luck in setting up your site. I know how frustrating it can be at times. Cheers! I found you via Theodora and can totally relate to this post! The ‘it can’t be done’ attitude is my main motivator! We travelled rtw with our two girls in 2007-8 (7 months of it in Asia) and it changed us so much we now live in Spain. I’ll warn you now – it’s REALLY hard to go back to ‘normal’ life again. Have fun planning! Hi Rachel! Your story is inspiring. I’ve been thinking quite a bit about what our return will be like and how we will react to trying to fit back into our so called ‘normal’ life. There is no doubt in my mind that this adventure will change us. I guess I am wondering if it will change us enough that we won’t be able to fit back into the same square peg we left from? Maybe we won’t want to. I thoroughly enjoyed reading about your travelling adventures and it has made me even more determined with my dream of going to the Far East for about 9 weeks during the summer if my husband can get a sabbatical from his work. I don’t think taking the kids out of school is going to do that much harm, in the general scheme of things, think about the wonderful experiences they will be gaining. Hi Tanya! Thanks so much. Traveling to the Far East sounds like a great adventure. This will be our first experience homeschooling so we don’t really know what to expect but I do know that the experiences my kids will have will trump any classroom. Good luck on the sabbatical!